A talking Parakeet and its owner arrive at Dholakpur to spy on it. Meanwhile, the good witches land, Agadam, is under attack from the neighboring magical kingdom of Bagadam. To add to all this a confused camel with a gem stone in its saddle mysteriously arrives at Dholakpur and the kingdom falls trap to burglars. Raju also finds himself trapped in a magical painting and will have to be rescued by the end of the day. 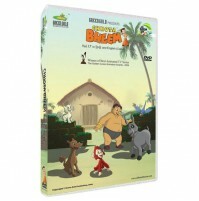 Watch Bheem set out on yet another series of challenges filled with obstacles and emerge as the true hero.